I spoke yesterday of malic acid, and also of Kyoho grapes. Moreover, I have written in the past of the inspiration that I found at bar Gen Yamamoto, which informed an apricot cocktail earlier this summer. In that post, I described the philosophical underpinnings of this drink. I wanted to apply Gen’s “shiki” style of Japanese seasonality to the Kyoho grape, so I started with brandy as a base to preserve the purity of the grape’s flavor. We can add a bit of drama to this otherwise harmonious pairing by playing up the contrast between sweet and sour. I would not make such an attempt with standard souring agents, but since malic acid is already present in the grape, the additional tartness feels very natural and flowing. Shake and double strain into an Old Fashioned Glass. Garnish with a grape. The grape on its own was a little too simple. With the brandy tracking so closely to the grape juice, I needed one other flavor to create some space and some distance in the perception of the drink’s flavor, and lavender worked surprisingly well. I did not anticipate the deliciousness of this pairing, and I was pleasantly surprised. Lavender and grape were made for each other, and I imagine that lavender grape preserves would be wonderful. I think this drink beautifully captured the experience of a fresh grape, while maintaining a refined complexity. 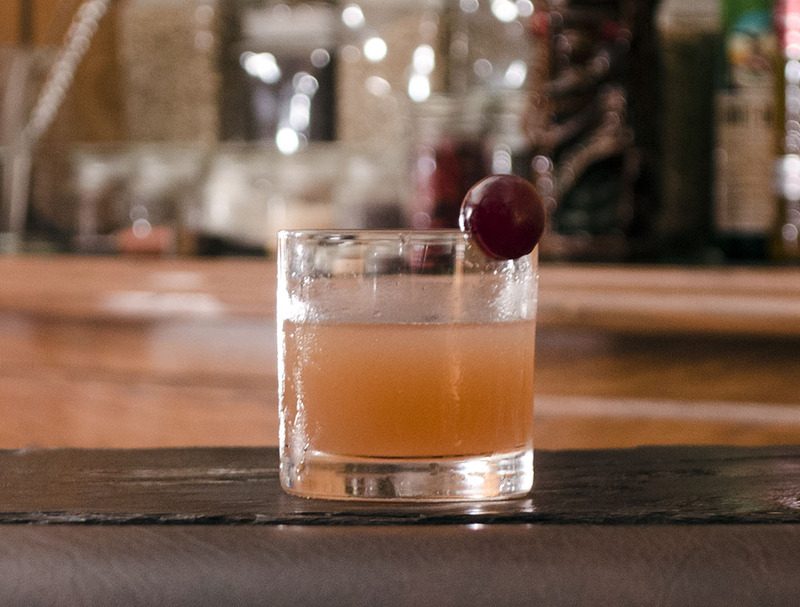 Categories: modern drinks, original creations | Tags: alcohol, angostura bitters, bartending, booze, brandy, cocktail, cocktails, cognac, craft cocktails, drinking, drinks, gen yamamoto, grape, kyoho grape, lavender, liquor, malic acid, mixed drinks, mixology, scrappy's, shiki | Permalink.